Fibroblast growth factor receptor 3 is a protein that in humans is encoded by the FGFR3 gene. FGFR3 has also been designated as CD333 (cluster of differentiation 333). The gene is located on chromosome 4q16.3 is "expressed in tissues such as the cartilage, brain, intestine, and kidneys." This particular family member binds both acidic and basic fibroblast growth factor and plays a role in bone development and maintenance. Alternative splicing occurs and additional variants have been described, including those utilizing alternate exon 8 rather than 9, but their full-length nature has not been determined. Mutations in this gene can develop dysfunctional proteins "impede cartilage growth and development and affect chondrocyte proliferation and calcification" which can lead to craniosynostosis and multiple types of skeletal dysplasia (Osteochondrodysplasia). The point mutation in the FGFR3 gene causes hydrogen bonds to form between two arginine side chains leading to ligand-independent stabilization FGFR3 dimers. Point mutations in the FGFR3 gene, “causes defective growth of long tubular bones”. By inhibiting chondrocyte proliferation, FGFR3 restricts long bone length. In achondroplasia, the FGFR3 gene has a point mutation at nucleotide 1138 resulting from either a G>A or G>C. FGFR3 mutations are linked with spermatocytic summons, which occur more frequently in older men. ↑ "Drugs that physically interact with Fibroblast growth factor receptor 3 view/edit references on wikidata". ↑ Keegan K, Johnson DE, Williams LT, Hayman MJ (February 1991). "Isolation of an additional member of the fibroblast growth factor receptor family, FGFR-3". Proceedings of the National Academy of Sciences of the United States of America. 88 (4): 1095–9. doi:10.1073/pnas.88.4.1095. PMC 50963 . PMID 1847508. 1 2 Wang, Y., Liu, Z., Liu, Z., Zhao, H., Zhou, X., Cui, Y., & Han, J. (2013). Advances in research on and diagnosis and treatment of achondroplasia in China. Intractable & Rare Diseases Research, 2(2), 45-50. 1 2 Kelleher FC, O'Sullivan H, Smyth E, McDermott R, Viterbo A (2013). "Fibroblast growth factor receptors, developmental corruption and malignant disease". Carcinogenesis. 34 (10): 2198–205. doi:10.1093/carcin/bgt254. PMID 23880303. 1 2 Foldynova-Trantirkova S, Wilcox WR, Krejci P (2012). "Sixteen years and counting: the current understanding of fibroblast growth factor receptor 3 (FGFR3) signaling in skeletal dysplasias". Human Mutation. 33 (1): 29–41. doi:10.1002/humu.21636. PMC 3240715 . PMID 22045636. ↑ Lamy A, Gobet F, Laurent M, Blanchard F, Varin C, Moulin C, Andreou A, Frebourg T, Pfister C (December 2006). "Molecular profiling of bladder tumors based on the detection of FGFR3 and TP53 mutations". The Journal of Urology. 176 (6 Pt 1): 2686–9. doi:10.1016/j.juro.2006.07.132. PMID 17085196. ↑ Mulliken JB, Steinberger D, Kunze S, Müller U (November 1999). "Molecular diagnosis of bilateral coronal synostosis". Plastic and Reconstructive Surgery. 104 (6): 1603–15. doi:10.1097/00006534-199911000-00001. PMID 10541159. 1 2 Santos-Ocampo S, Colvin JS, Chellaiah A, Ornitz DM (January 1996). "Expression and biological activity of mouse fibroblast growth factor-9". The Journal of Biological Chemistry. 271 (3): 1726–31. doi:10.1074/jbc.271.3.1726. PMID 8576175. 1 2 Chellaiah A, Yuan W, Chellaiah M, Ornitz DM (December 1999). "Mapping ligand binding domains in chimeric fibroblast growth factor receptor molecules. 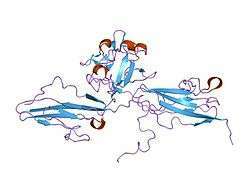 Multiple regions determine ligand binding specificity". The Journal of Biological Chemistry. 274 (49): 34785–94. doi:10.1074/jbc.274.49.34785. PMID 10574949. Bonaventure J, Silve C (November 2005). "[Hereditary skeletal dysplasias and FGFR3 and PTHR1 signaling pathways]". Médecine Sciences. 21 (11): 954–61. doi:10.1051/medsci/20052111954. PMID 16274647. Olsen SK, Ibrahimi OA, Raucci A, Zhang F, Eliseenkova AV, Yayon A, Basilico C, Linhardt RJ, Schlessinger J, Mohammadi M (January 2004). "Insights into the molecular basis for fibroblast growth factor receptor autoinhibition and ligand-binding promiscuity". Proceedings of the National Academy of Sciences of the United States of America. 101 (4): 935–40. doi:10.1073/pnas.0307287101. PMC 327120 . PMID 14732692.